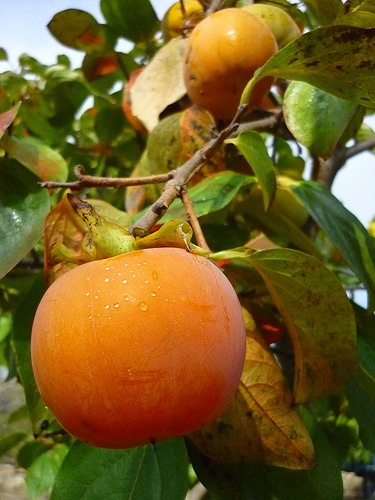 Caqui , or Persimmon to you ;) | La Rosilla - Lifestyle and food. My virtual ‘Twitter’ friend @carolmarybyrne, like me lives in rural Andalucia, but although I’m up in the ‘Montes de Malaga’ and feel quite high and remote, at least when some visitors arrive, they often speak about altitude sickness !!! Carol is higher in the unspoilt Alpujarras 1114m UP ! We share a love, of local, fresh home grown produce – We share a love of recipes, cook books and we share a love of sharing this..Gosh that’s a whole lot of sharing going on. So when I read Carols blog post today , I asked if I could share it . 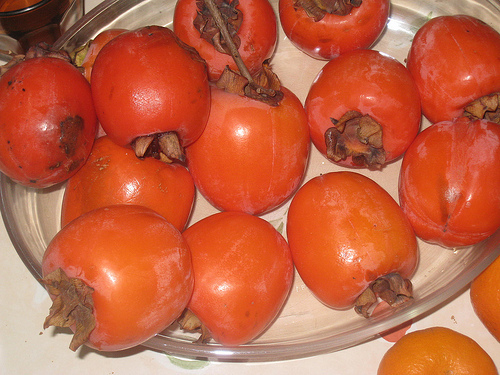 Our next fruit on the seasonal platter is the Kaki, or Persimmon to many, it grows natively in our neck of the woods. And can be seen its orange globe like presents hanging from it’s tree, well that is if your goat hadn’t eaten your tree, as happened at La Rosilla. I have been sooo lazy with this blog! As November starts I shall make an early NY resolution to get on a bit more with it. Today the bag was from Antonio and the contents a ton of Caqui fruit – persimmon to you! Now, if you´ve ever taken one and bitten into it straight off the tree – yeuch! Like the olive – no way baby! Astringent is the only word, these little fruit can dry your mouth in seconds…………..but there is a trick. Place a circle of them whole and unpeeled in a stainless steel container, with a shot glass of any clear alcohol – Gin, Vodka – whatever in the middle. Allow them to ripen and the booze will do the trick of removing any astringency like magic. Also, slice some harder ones across the middle and lay them on a cake rack on top of your log burner if you have one…or the airing cupboard if you have one of those! Allow to dry naturally for a super chewy fruity vitamin packed snack…kids love them. Go Moroccan and casserole with Chicken or Lamb. Use the fruit for cakes with dark brown sugar – yum . Or place in a lidded container with vodka and sugar and allow to develop into a Christmas drink with a punch – wow! I love Autumn – the fig season has ended – the Granadas – Pomegranates – are nearly all burst open with their fat red jewels – but we still have the Caqui, citrus fruits, wild Saffron Milkcap mushrooms and the olive harvest to come….Like a good Joanne Harris novel – bottles and jars are rattling with anticipation!